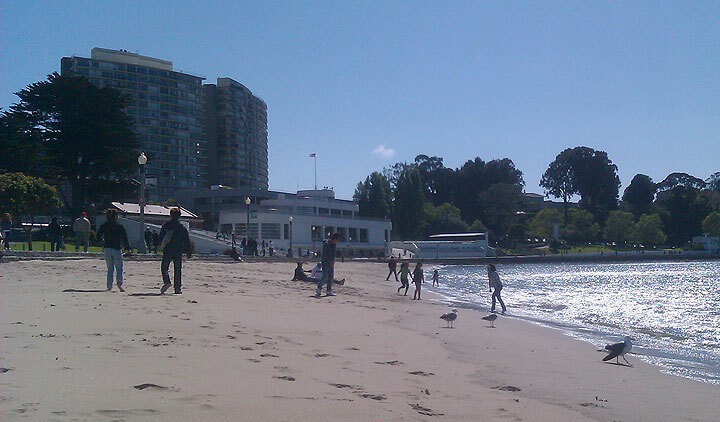 Maritime Museum, low white building that looks like a ship, seen here across the Aquatic Park beach in May 2011. 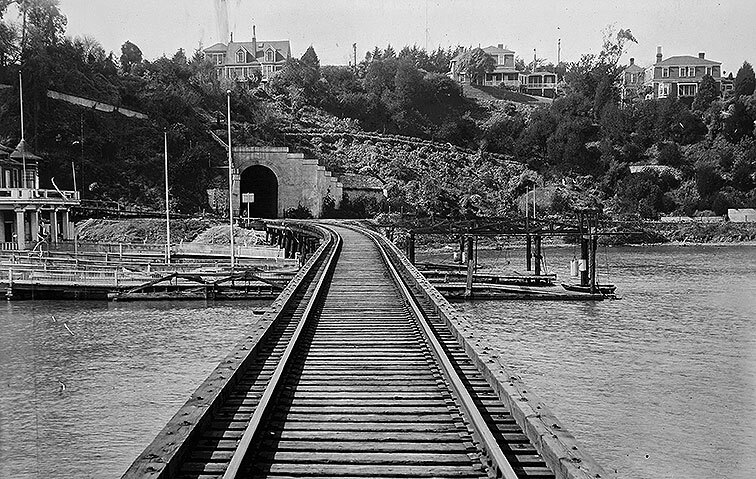 Black Point train and tunnel, 1918, when the military would send goods to Fort Mason for shipment to military bases in the Pacific, including Hawaii and the Philippines (a U.S. territory from 1898 to 1946). 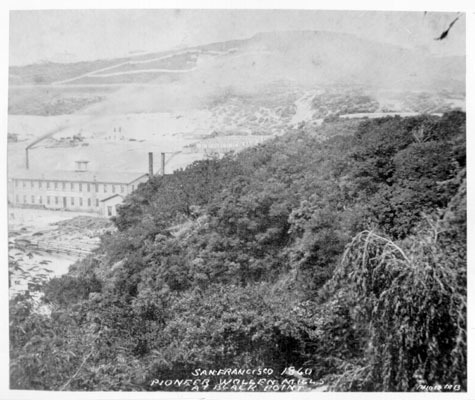 Pioneer Woolen Mills with Black Point behind, n.d. 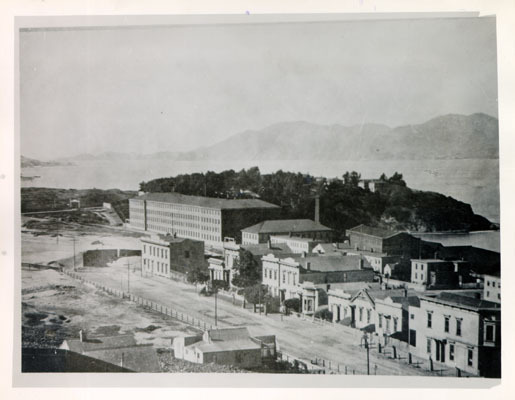 In 1867 the Pioneer Woolen Mill dominated the landscape near the area we call today Aquatic Park. In 1895 the Dolphin Club moved to the area. It was founded by Germans but by the end of the century the Irish and Italians had become members. 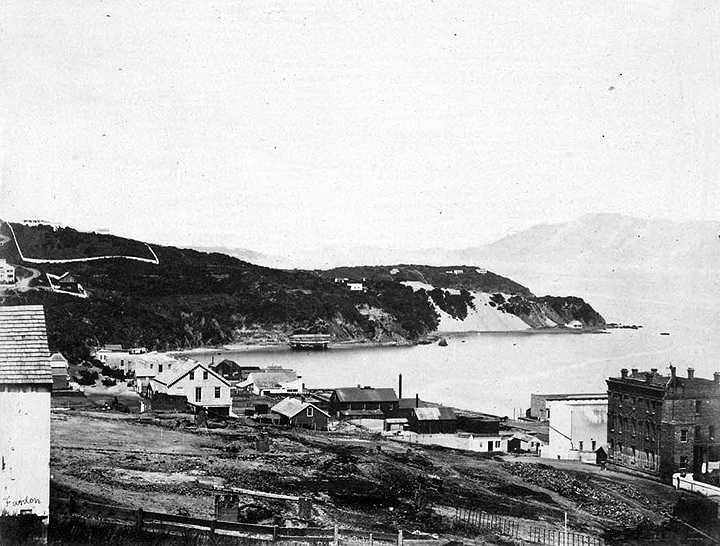 The San Francisco Bay had been a dumping ground as the city expanded towards the bay. Much of today’s shoreline properties are composed of fill/debris from the many fires, earthquakes, and other catastrophes. Black Point in middle distance, with hills of Marin County in distance, at right. The beached ship is visible on the shore of Black Point, where it served as an insane asylum. 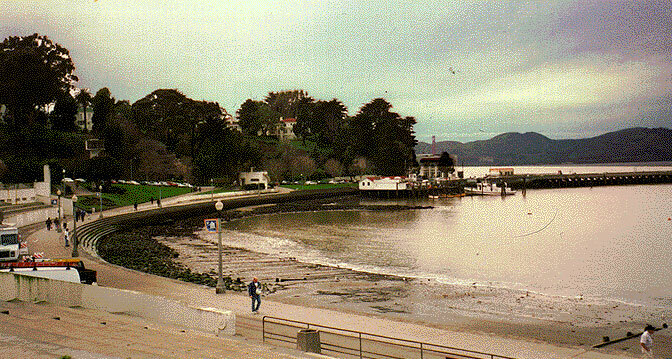 What we know as Aquatic Park was called Black Point Cove back in those days. Whether the dumping had anything to with that name I don’t know but the waters became so murky most wouldn’t swim in it. Many efforts were made to have the area declared a park so the dumping would stop but all efforts failed. Ironically it took the ’30s depression and the WPA Federal Arts Project to get the area protected and the Art Deco-style Maritime Museum built. Many of the same people who were involved with the WPA Federal Art Projects citywide did the art at the museum. 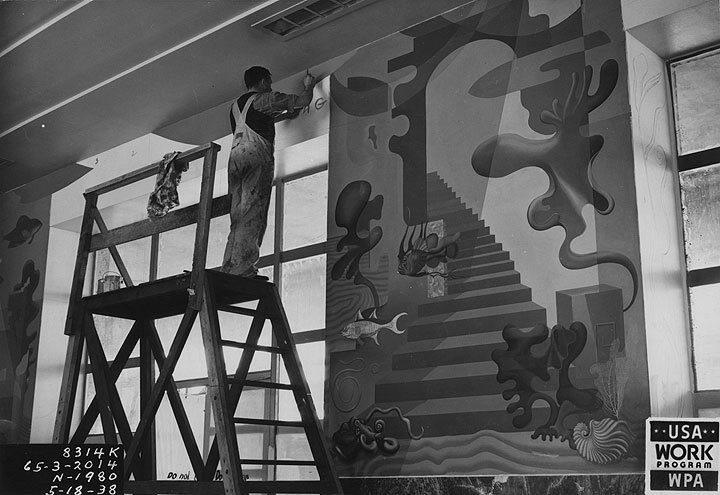 May 18, 1938, painting interior murals at the Aquatic Park building. 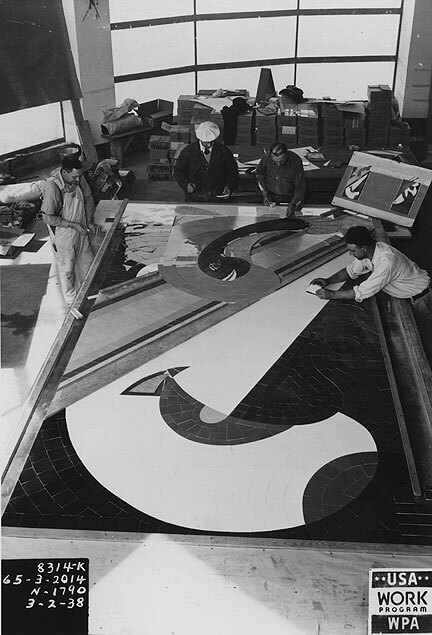 March 2, 1938, working on mosaic floors in Aquatic Park building. Maritime Museum turtle mosaic on floor. Hilaire Hiler was the main mural designer but also had a part in designing the many fixtures. His designs sought to enhance the murals. He was a man of many talents and lived and worked in Europe as an artist and jazz musician. He finally had to leave Europe as anti-Semitism was raising its ugly head. In 1934 he arrived in San Francisco and began his work. 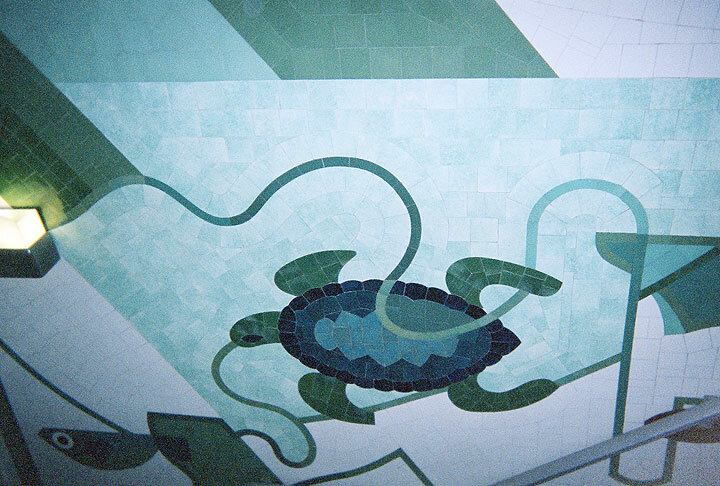 The nautical shape of the building allowed him to best use his expressionist ideas and so the theme for the murals was “Mu and Atlantis.” Many real and mythical fish and organisms are seen swimming in a greenish sea. He was assisted by San Francisco artist Sargent “Claude” Johnson. Johnson was a man of mixed heritage who had lived and worked in Washington DC. His father was White and his mother was Black/Cherokee. He could have passed for White or Native American as some of his kin did. He chose to live his life as a black man. He had come to San Francisco during the 1915 Pan Pacific Exposition and stayed. From 1926 to 1935 he was world-renowned for his Black subject matter. He resided here until his death in 1967 and lived and worked for a number of years in the 1500 block of Grant Avenue. He favored black portraits, masks and mother child images. Coincidentally I lived in that same block at the same time and remember seeing some of the displays in his shop windows. Was I smart enough to buy any? Of course not. If you are a city native or long time resident you may have seen some of Johnson’s work at George Washington High School, the Beach Chalet or Coit Tower. 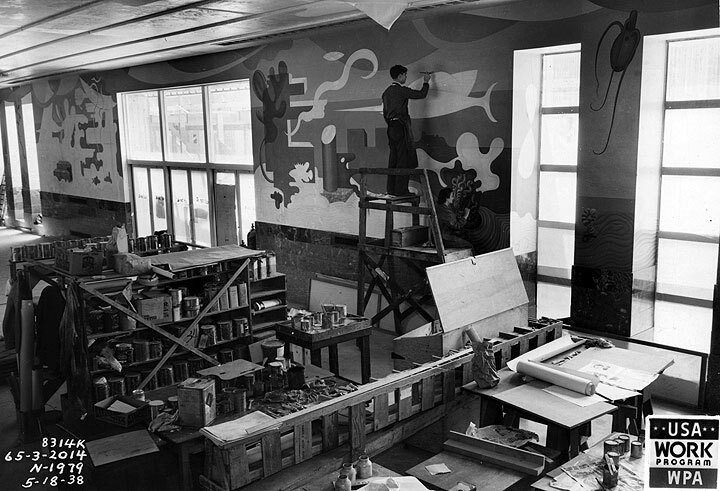 Aquatic Park mural painting, May 18, 1938.